Whew...that was quite a blogging break I took! I was never planning on being away but the last few weeks have been extremely busy with decorating, sewing, hosting holidays, traveling, etc. I have several projects to blog about, but haven't found the time to edit photos and posts. Hopefully I can get a few up before my next major task- painting the kitchen cabinets!!!! For my friend's skirt, I stuck with the black and white look, but for mine, I went with navy. 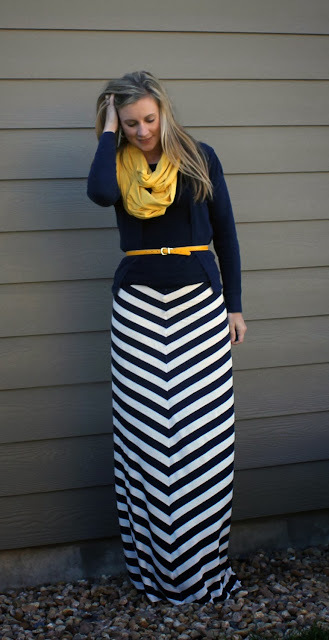 I tend to wear navy a lot more often and thought I would be able to get more use out of it. To start I ordered 4 yards of each (black and navy) fabric from girlcharlee.com: I can no longer find the blue, but here is a link to the black. 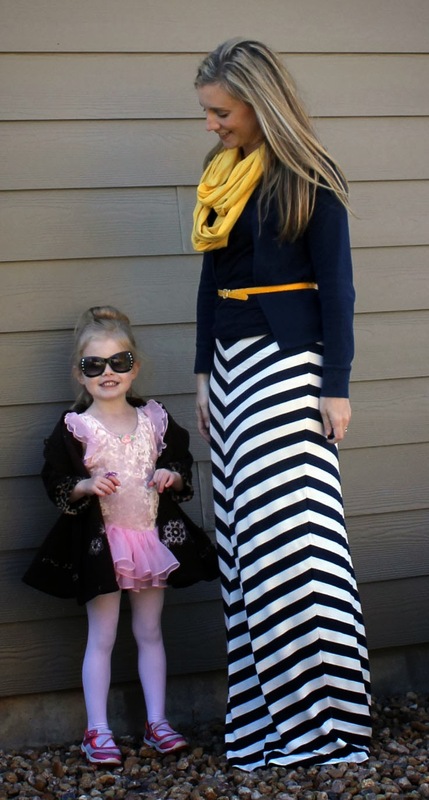 Both fabrics were a cotton spandex knit. They had a light and beautiful drape and are very soft, however they are a bit sheer and require a slip underneath. 1. Begin by gathering the measurements need to create a pattern following Mad Mim's wonderful tutorial. 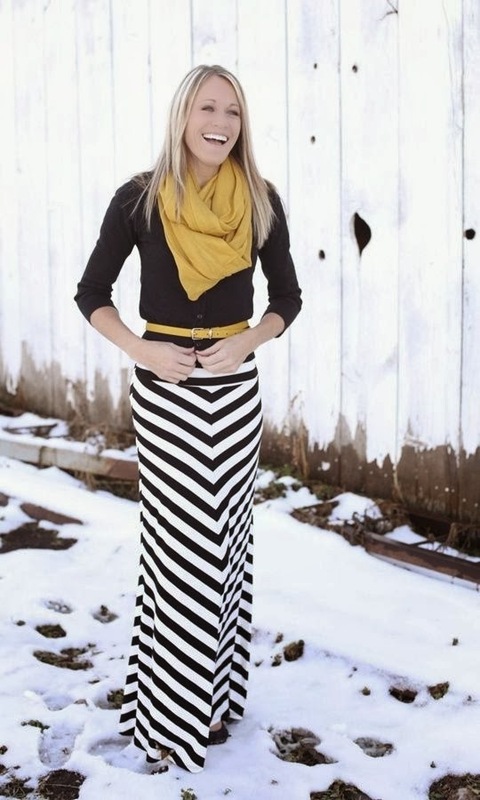 The only difference I made to the a-line pattern was adding a few more inches at the bottom to create more of a flare. 2. Draw your pattern onto freezer paper and cut it out. Lay your fabric out flat, with no folds. 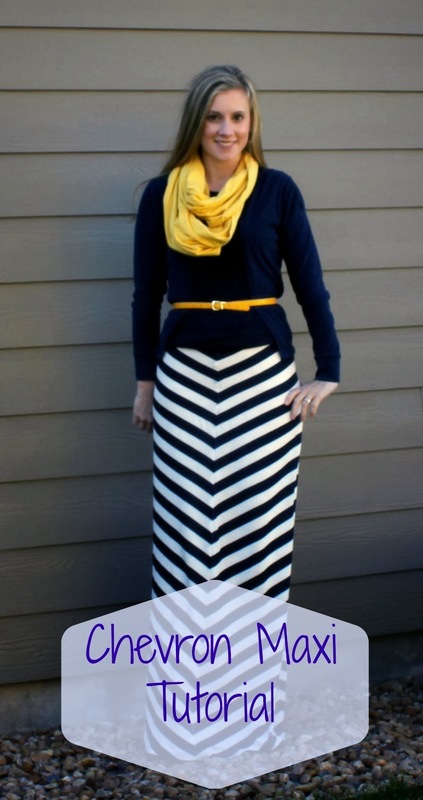 Lay your pattern onto your fabric diagonally to create one panel for your chevron skirt. (You will cut 4 total panels. 2 for the front and 2 for the back). I laid mine down to have the chevron point going down in the center and up at the side. The straight line side of the pattern is the center seam and you can see the stripe will be diagonal on the panel and will point down in the center where the panels will be sewn together. To get the most out of your fabric, after cutting this panel, move the fabric over and cut another panel that is identical to this one. (One of these will be used in the front and one in the back). 2. Next, turn your cut panel piece over and use it to line up the diagonal stripe on the other side of the front piece. 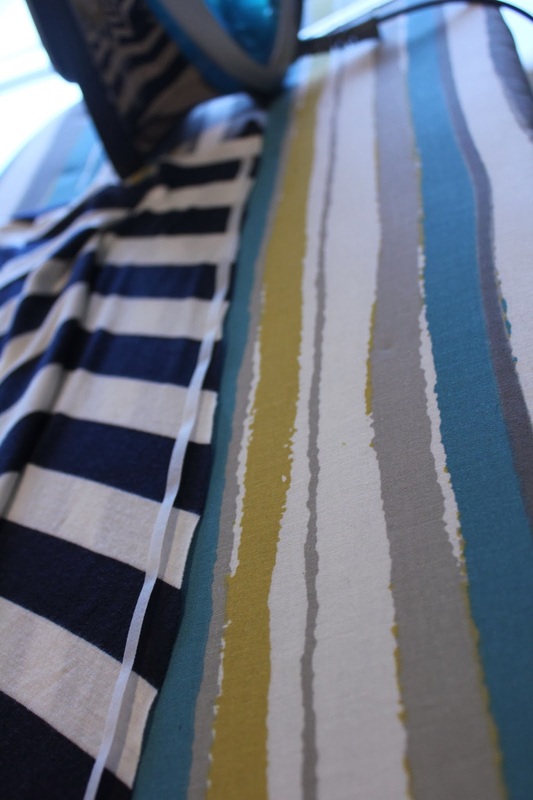 You will want to lay it flat on top of the fabric (right sides together), lining up the stripes. 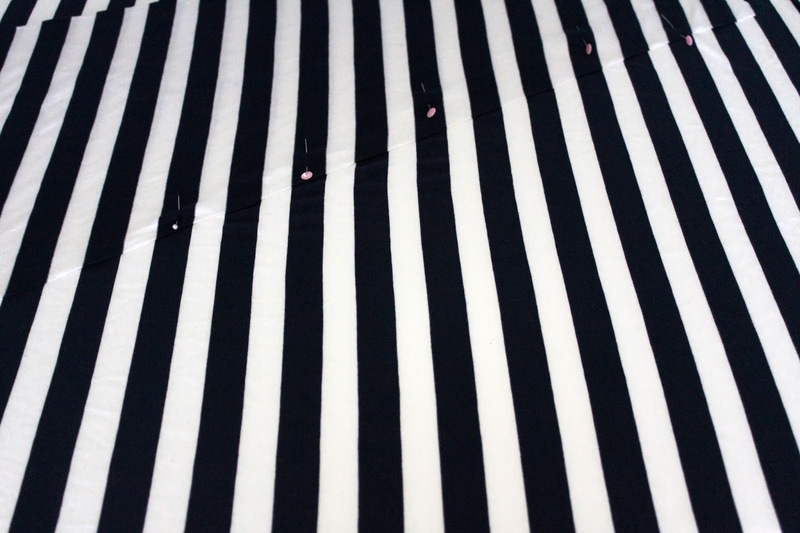 Make sure your straight line (the center seam) is still going to have the stripe pointing down. Then pin, pin, and pin some more. Make sure your lines are staying straight and then cut out your 2nd panel piece. Do the same for the back. After cutting you should have 4 panels. 3. Next, sew your 2 front panels together on the straight center seam line. 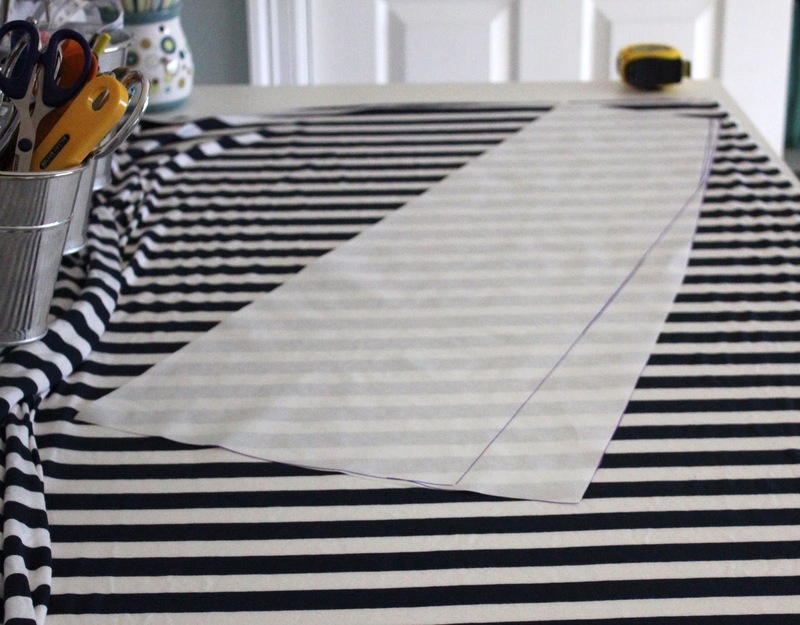 To get your stripes to line up and not shift, use steam a seam prior to stitching. Remove a piece of steam a seam a lay it down the length of one center seam line. (Lay the steam a seam on the RIGHT side of the fabric.) Then peel back the tape and lay your other skirt panel on top (Right sides together) making sure you are lining up your stripes. Once everything looks good, iron the steam a seam to create a permanent bond. After it cools, stitch a straight stitch with your machine, making sure your stitching line is further in than your steam a seam so that none of the steam a seam shows once your skirt piece is opened right side out. (Make sure you use a needle appropriate for sewing on knit fabric and adjust your tension as needed). 4. Repeat step 3 for the back 2 panels. Then, stitch the front and back panels together at the side seams. 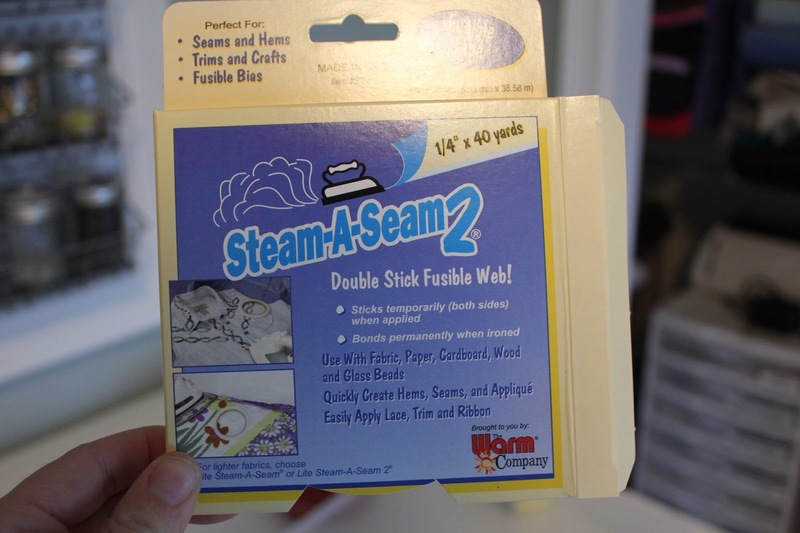 Use your steam a seam on these seams as well to make sure your lines meet up correctly and stay that way prior to stitching. Finally, create the waistband and hem using Mad Mim's tutorial. On my skirts, I only used one straight stitch on my hemline, instead of using a double needle. Because I tend to flare my skirts more, there is plenty of room to walk without it pulling the hem which would break the thread. Great job in re-creating the look!